North Korea’s military carried out a successful ejection test of a new submarine-launched ballistic missile recently, an indication that an earlier test failure has not derailed the underwater missile program, U.S. defense officials said. The test of the submarine-launched missile, or SLBM, which the Pentagon has called the KN-11, from a submerged submarine on Dec. 21 took place near the port city of Sinpo, where the capability is being developed. The facility is located along the North Korean coast of the Sea of Japan. The test followed a Nov. 28 ejection tube launch failure that damaged North Korea’s first missile submarine, which officials identified as the Gorae, Korean for whale. No additional details of the test could be learned, including whether the missile’s engine ignited after the ejection or whether the missile took flight. North Korean state-run media did not publicize the latest test. In May, North Korea announced that its developmental SLBM was flight tested from what analysts believe was an underwater test platform. One official said that based on the latest successful ejection test, North Korea could be as little as a year away from deploying a submarine armed with a nuclear-tipped missile. Other analysts remain skeptical that the North Koreans can master the technology for submarine missile firings. At the Pentagon, spokesman Cmdr. Bill Urban had no comment. "We are not going to be able to provide any information regarding matters of intelligence," he said. But military analysts said the successful test is a significant step forward in the difficult technical challenge of firing a missile from a submerged submarine. North Korea is building up its missile forces in an effort to develop a nuclear strike capability. Its current force of strategic missiles includes long-range Taepodong missiles that are vulnerable to preemptive strike because of the time it takes to prepare the missiles for launch. To develop a more survivable missile force, North Korea has a small number of KN-08 road-mobile ICBMs and has also been developing the KN-11. The SLBM program was first disclosed by the Washington Free Beacon in August 2014. North Korea is believed by U.S. officials to have obtained the technology for a small warhead capable of being carried by missile in the late 1990s or early 2000s from the covert Pakistani nuclear supply network led by A.Q. Khan. David Maxwell, a retired Army colonel and expert on North Korea at Georgetown University, said a North Korean missile submarine could be a significant challenge to the United States and its allies. "If they can successfully field an operational SLBM in a capable submarine that can evade advanced anti-submarine measures, it could be a game changer as it could give them a possible second strike capability in a nuclear exchange," Maxwell said. Maxwell said he suspects the North Koreans remain "some ways off" from fielding a missile submarine and the current forces of submarines are not advanced and thus could be tracked. "If we were to determine that they had the capability, we would focus our anti-submarine efforts on perhaps one or two submarines that they might be able to deploy," he added. Maxwell noted that North Korea has "surprised us before" in developing arms and missiles. "What I think is most important is that their pursuit of an SLBM capability is another indicator that they believe their nuclear program is key to regime survival, and that they have absolutely no intention whatsoever of ever giving up their nuclear program," Maxwell said. Bruce Bechtol, a former Defense Intelligence Agency expert on North Korea, said the North Korean missile thought to be used in the test is a variant of an SS-N-6 SLBM obtained covertly from Russia. Bechtol, a professor at Angelo State University, said North Korea, with one of the largest missile arsenals and production capabilities in Asia, appears to have been able to reverse engineer an SLBM from one SS-N-6, just as Pyongyang was able to develop an array of missiles after obtaining a Russian short-range Scud decades ago. "North Korea has moved more quickly than most analysts would have anticipated on the SLBM program," Bechtol said. "Not only do they now have a missile that can successfully be fired using the technically challenging procedure of sub-surface launching… but now it appears they are actually able to do this from a submarine—as evidenced by the most recent test," he added. When operational, the submarine and missile capability will provide Pyongyang with a new strike option that could be potentially lethal to the United States and its allies. Iran is believed to have acquired North Korea’s Musudan missile, and reportedly uses technology from the SS-N-6 in the Safir rocket, he said. The origin of the Gorae missile submarine is not known. It is believed to be based on either a Soviet design Golf II-class submarine, or reverse-engineered from Golf II submarines obtained by North Korea in the 1990s. The submarines are designed with launch tubes in the vessel’s sail and are believed to be capable of launching two missiles. Commercial satellite photographs have identified the submarine and a test platform at the coastal facility at Sinpo. Rick Fisher, a military affairs analyst with the International Assessment and Strategy Center, said the latest test indicates the North Koreans are making progress in the SLBM program. "With an operational SLBM, North Korea will have more options for nuclear coercion against South Korea, Japan, and the United States, as well as being able to offer a new weapon of mass destruction for export," Fisher said, noting Iran would likely be among the first customers of an SLBM design. North Korean leader Kim Jong Un made no mention of the new submarine missile program in his New Year’s day speech. Kim warned that the Korean Peninsula is becoming "the world's biggest flashpoint and origin of nuclear war today" because of what he said were South Korean and U.S. nuclear war exercises. Meanwhile, North Korea may be preparing to conduct an underground test of a thermonuclear weapon, according to a South Korean military report. "We can't discount the possibility that the North's excavation of a new tunnel at its Punggye-ri test site could be designed for thermonuclear weapons tests," said the Chemical, Biological, and Radiological Defense Command, a Defense Ministry group, in a report made public Sunday. "Considering its research of nuclear technology, its history of underground and projectile tests, and elapsed time since its nuclear development, North Korea has the foundation for thermonuclear weapons," the report said, according to the official Yonhap news agency. Thermonuclear bombs have more explosive power than early-generation nuclear arms. The weapons use the energy from a primary nuclear fission reaction to compress and ignite a secondary nuclear fusion reaction with greater blast yield. 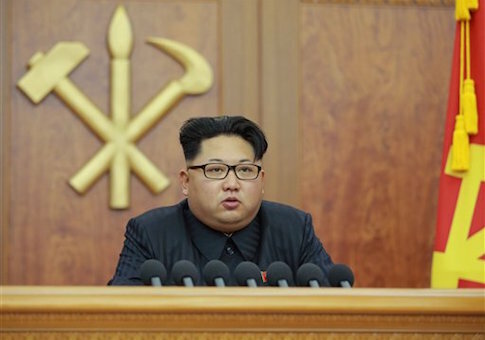 North Korea’s leader Kim Jong Un has announced that it is capable of building hydrogen bombs, though the South Korean report contested this assertion. "The North could detonate its boosted fission weapon, but we don't believe it is yet capable of directly testing hydrogen bombs," the command report stated. North Korea carried out three nuclear tests in 2006, 2009, and 2013 at the Punggye-ri test facility in the northeastern part of the country. A South Korean Defense Ministry-affiliated think tank warned in a report made public last week that North Korea is pushing ahead with additional nuclear tests. "As threats to conduct nuclear and missile tests themselves have considerable impact on the regional balance of power, the North is expected to remain ready and seek appropriate timing for the tests while maintaining ambiguity about its ultimate intentions," Institute for Defense Analyses stated in the report made public Jan. 3. Republican presidential candidate Donald Trump on Sunday warned that North Korea poses a nuclear threat. "Nuclear is a major problem," Trump said on Face the Nation. "And we have major problems, because you have other people that would be very fast on that. You look at North Korea, you look at some of these countries, I don't think they would hesitate to use it if they really had it in a proper manner."